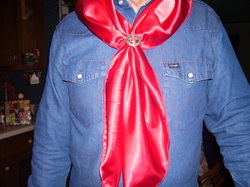 Ridin' Rank Wild Rags was started after I made a few rags as Christmas presents and posted them on Facebook. Friends started asking me to make some for them. All rags are made here in my home, in the United States(Arkansas). The rags come in many colors, patterns and sizes. Prices depend on the size and type of fabric the rags are made from. Go to my facebook page Ridin Rank Wild Rags and go into the photos then the albums. All of the pics will have sizes and prices with them. Please make a comment on the picture of size and how many you want. Or you can get the number with the pic and album name and send me an email to chuckwagonbs@hotmail.com. I take paypal, check or money order. Once I receive a payment then I will order the fabric unless I have one of the rags on hand. It usually takes about a week for the fabric to get to me then I make up the rags and get them out to you. Shipping is free in the USA but I do mail outside of the US. I make other items such as wagon tarps, flags, pillowcase dresses for little girls and hair ties and a few other things. 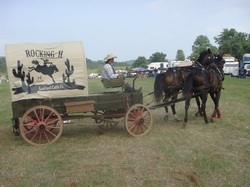 One of the other custom made items that I make are racing wagon tarps. Just like the rags the tarps are priced by size, type of fabric and size of design.